Albion Motor Company, Scotstoun, Glasgow. Homepage. This page: Scans of two original factory letters posted in the late 1920s. Albion Motor Car Company Ltd letters. Two vintage letters sent by the company. In its earliest days, between 1900 and 1915, the Albion Motor Car Company produced a number of lightweight motor-cars, powered by either a two- or four-cylinder engine. Now though the company is best remembered for its commercial vehicles, with its lorries being a regular sight on roads not just in the UK but across the globe thoughout the 20th Century. The company began to focus on the commercial vehicle sector of the market in 1909, with many of their vehicles seeing service during the Great War. Buses too would also be produced at the company's works in Scotstoun, Glasgow. 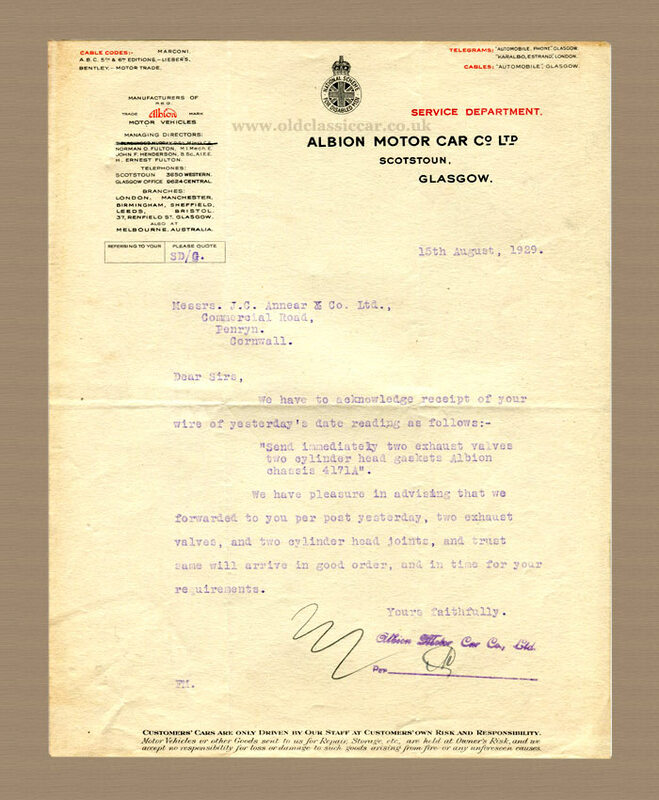 At the time of these letters, the company was known as the Albion Motor Car Company Ltd, but would be renamed to Albion Motors the following year, 1930. In 1951, Leyland Motors bought the company, although the Albion name would continue to be used for years to come. Engine valves and gaskets ordered. The first of the two letters I found is dated 15th August 1929, and like the later correspondence, was intended for the attention of a customer in Penryn, Cornwall, namely Messrs J.C. Annear & Co. Ltd, who were a building supplies, shipping and general haulage company. Clearly they operated at least one Albion vehicle, although the precise identification of the vehicle - presumably a lorry - isn't given. It may be of the type shown in a photo on this OCC page: photo link. 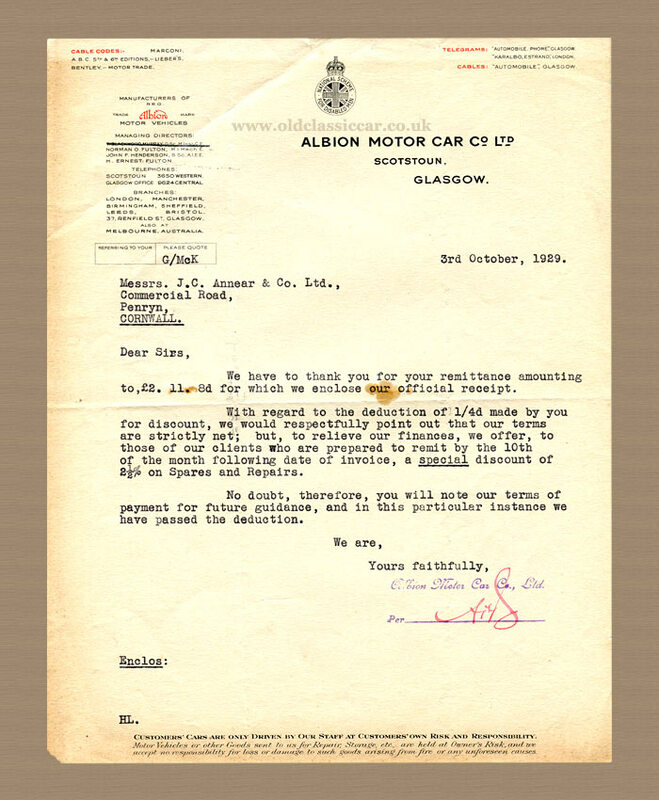 The letter was sent by the Service Department in response to a message received by Albion requesting that they "Send immediately two exhaust valves, two cylinder head gaskets Albion chassis 4171A". Clearly the parts reached the customer, and payment was received, although as a result of this Albion had to drop the customer a line once more, pointing out that customers didn't normally incorporate their own choice of discount on the sum owed. A discount of 2.5% would though be offered, in return for prompt settlement of the outstanding sum. The second letter is dated 3rd October 1929. Some years ago, a visitor to Old Classic Car emailed over memories passed to him by his grandfather. He'd worked at a firm in Scotland, and recalled collecting a new chain-driven Albion chassis & cab on behalf of his employer, despite never having driven any vehicle before - it may be found here. Return to the Car Collectables section of OCC.